Nothing hits home quite like a song about nostalgia, looking back, and cherishing those who made you what you are today. This rings true with Avenged Sevenfold’s “So Far Away.” Dipping back and forth between flashbacks and the present, the song has a rough yet soulful tone, full of memory. In the video, the words are supported by a series of flashbacks and images from the band’s past. Connecting the older members of the band to their younger, more carefree selves is a strong line up of chucks. The young band members take their bikes, and chucks, for a spin. The band members roughhouse in a flashback. 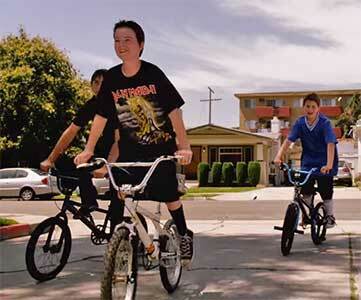 The video shows us the trajectory of the band’s existence, from its creation amidst bike rides and roughhousing, to its foundation as a strong, cohesive rock band. The contrast between the colored flashbacks and the black and white present makes for a bittersweet tone, one of memory, one of respect for the past, and one of a fondness for the days that brought us to where we are today. Finding relief in the shade on a hot day. All an aspiring drummer needs: drumsticks and his chucks . 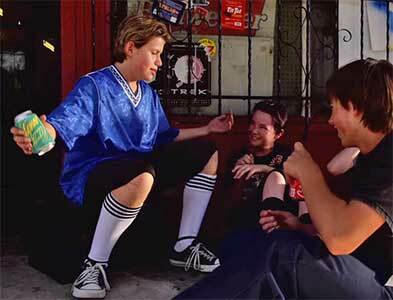 “So Far Away” is particularly enjoyable for all the close up and full shots of the young kids growing in their black high top and low cut chucks. It's a reminder that every kid should have at least one pair to wear growing up. As they grow older, their love for chucks sustains. Let your kids grow up right! Get them a new pair of chucks by clicking on the links below.